All you need to know about your diving holiday. Australia is one of the world’s most famous diving destination and offers scuba diving options way beyond common beliefs and expectations. The Great Barrier Reef is certainly the most popular place tourists visit as it offers easy access even for non-certified divers and snorkelers. The climate along Australia’s East Coast allows scuba diving all year round. Scuba diving in Australia is generally magnificent. The East Coast offers spectacular dive sites to tick off several of your bucket list dives including but not limited to diving at historic shipwrecks such as the SS Yongala, ex-Navy Ships, diving with Manta Rays, diving with Grey Nurse Sharks and the list goes on. When can you dive the Great Barrier Reef? All year round however, cancellation rates for dive and snorkel trips are higher in summer as summer is our storm season in Queensland. The most stable weather and best diving conditions are between May and October. The water will still be warm! Is the Great Barrier Reef dead? NO! The media does a great job sometimes to represent matters without perspective. To build an opinion on any subject, perspective is needed. For example, reporting that a school teacher drinks alcohol sounds alarming if read in isolation so we really need to add some information in regards to how much alcohol and whether in his free time or during working hours. Two tiny details and make all the difference in how a message is perceived. A reef is like a forest. Certain sections of the forest always get damaged at times and die off due to storm events, floods, fires and normal biological lifecycles but will regrow eventually or are offset by growth in other areas. This is called an Eco System. The Great Barrier Reef is very similar. For example, after a big cyclone, sections of the reef will suffer damage as the reefs intended purpose by nature is to provide coastal protection to the main land (buffer zone). The reef extends thousands of kilometres and unfortunately some visitors see benefit to photograph a damaged section that represents not even 0.01% of the reef and publish it via social media, claiming the reef is dead without providing any sort of perspective. The reef is full of life and worth visiting for many generations to come. That depends who you ask and what your expectations, desire and experience level is. It is not uncommon that local Aussie divers prefer their local dive site instead of the Great Barrier Reef. For example the Brisbane area with North Stradbroke Island and the Gold Coast offers spectacular diving with larger critters, allowing encounters rarely occurring at the Great Barrier Reef. In simple terms, the Great Barrier Reef is all about colours and Nemo. Shallow, easy diving however you rarely see larger the marine life such as big sharks or Manta Rays. Our local area has the unique mix of Grey Nurse Shark and Humpback Whale Migration during winter and Manta Rays and Leopard Sharks in summer. Many locals choose this over the Great Barrier Reef and only occasional head up north for a dive on the reef. We simply love our local Gold Coast scuba diving. How much does it cost to go scuba diving in Australia? Dive prices are influenced by the distance a boat has to travel, the dive sites popularity and local competition. 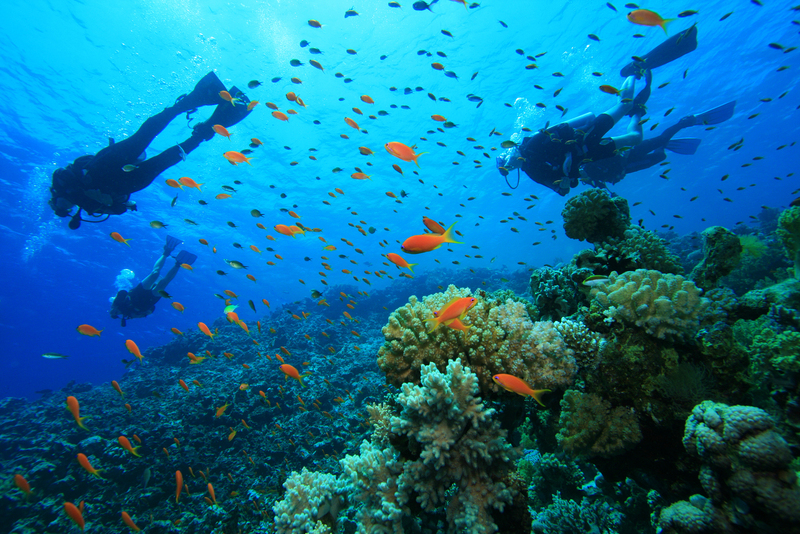 An introductory dive costs around $150 to $280 per person for a single dive. The price varies with the location. This usually includes all dive equipment that is needed. Certified diving is usually priced with a base price per dive trip that often includes 2 dives with tanks and weights. Equipment is then hired on an item by item basis. As a rough guide, a double dive trip with tanks and weights costs between $125 and $250 per person. If you add gear hire, you may look at $190 to $300 per person. Is Scuba Diving in Australia dangerous? Australia has the most regulated diving industry in the world. There are very strict Health and Safety regulations that force operators to run a highly professional operation, often to a level of safety that most overseas divers have never experienced before. There is of course always someone that tries to cut some corners so make sure you check online reviews before deciding on a diving operator. How much does PADI certification cost? A 3 day PADI Open Water Diver Course in Australia with a proper dive centre that conducts training dives from boats costs between $600 and $850 per person. There are always cheaper offers sometime but the quality of these courses are questionable. Contact us if you would like to find out more about dive course pricing or refer to our related blog posts. What age can you scuba dive in Australia? The minimum age for a full certification course is 10 years. For an introductory (one off) diving experience the minimum age is 12 years. Do sharks ever attack Scuba Divers? If you are on a normal scuba dive, then you have absolutely nothing to worry about. Sharks do not attack scuba divers and are typically not interested in a group of strange looking creatures that make funny bubble noises. Great White Sharks are shy and think twice whether they come close to you. You have to be very lucky to encounter a larger shark whilst scuba diving in Australia, something that smany locals need to wait many years for. Sharks sometimes accidentally attack swimmers and surfers due to mistaken identity. A scuba diver underwater does not represent any sort of pray that a shark could mistake the diver for. The only occasions that we are aware of where a scuba diver was attacked by a shark involved active interference with the shark which we strongly discourage. This includes handling or feeding the sharks or spearfishing. The only reason why divers dive with Great White Sharks from a cage is because of all the bait and fish blood that is dumped into the water prior to the dive. Thinking a bout it logically. If the water is full with dead and bleeding fish, you are better off in a cage. We know many divers that have encountered a Great White Shark naturally and it was one of the most amazing experiences they ever had. Most sharks we encounter frequently are harmless and reasonably small. Where else to dive in Australia? Scuba Diving in Australia is much more than just the Great Barrier Reef. Check out these blog posts from other dive sites along the East Coast, Australia. It is certainly worth to go on a scuba road trip.